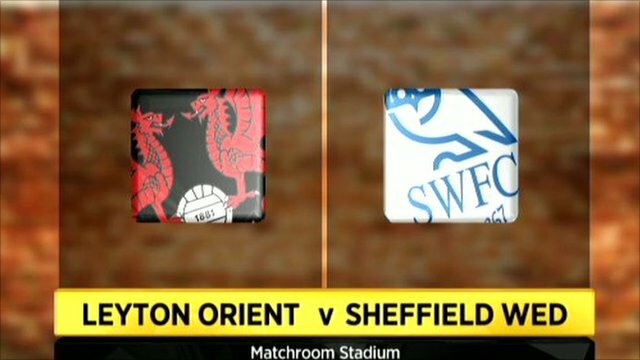 Leyton Orient maintained their excellent home form with a thumping victory over Sheffield Wednesday. Chris Sedgwick almost gave the Owls a first half lead but his header was cleared off the line. Ben Chorley put the hosts in front from the penalty spot after Gary Teale handled in the area and Harry Kane doubled the lead with a neat finish. Alex Revell headed home a third from Charlie Daniels' cross before Paul-Jose Mpoku hammered home a free-kick. "They came with a good game plan and they contained us a little bit in the first-half. "We kept our energy levels really high because the lads have been working really hard and we've got a very fit bunch of players. "We thought if we kept trying to do what we wanted in the first half, and be patient in possession, we'd get our rewards." "A very poor performance in the second half, obviously from set pieces in particular. The penalty might have been a little harsh but we crumbled after that. "We obviously gave ourselves problems with the way that we defended free kicks. I felt we were very much in the game but we didn't score. "At half time I felt as if we were very much in the game but that wasn't the case." 90:00+4:09 The referee blows for the end of the match. 90:00+1:28 The assistant referee signals for offside against Jonathan Tehoue. Indirect free kick taken by Nicky Weaver. Correction - 88:47 Unfair challenge on Chris Sedgwick by Matthew Spring results in a free kick. Gary Teale takes the free kick. Jermaine Johnson takes a shot. Blocked by Andrew Whing. 88:47 Free kick awarded for a foul by Matthew Spring on Chris Sedgwick. Gary Teale takes the free kick. Jermaine Johnson takes a shot. Andrew Whing gets a block in. 87:07 Daniel Jones delivers the ball, Ben Chorley manages to make a clearance. 85:14 Jonathan Tehoue is flagged offside by the assistant referee. Free kick taken by Mark Beevers. 84:40 Paul-Jose M'Poku takes a short corner. 83:50 Neil Mellor concedes a free kick for a foul on Paul-Jose M'Poku. Direct free kick taken by Paul-Jose M'Poku. 83:50 Booking Neil Mellor goes into the book. 83:10 GOAL - Paul-Jose M'Poku:Leyton Orient 4 - 0 Sheff Wed Paul-Jose M'Poku fires in a goal from just outside the penalty box to the bottom right corner of the goal. Leyton Orient 4-0 Sheff Wed. Correction - 81:04 Booking The referee shows Gary Teale a yellow card for unsporting behaviour. Correction - 81:04 Reda Johnson challenges Alex Revell unfairly and gives away a free kick. Charlie Daniels provided the assist for the goal. Charlie Daniels crosses the ball in from the free kick, Foul by Chris Sedgwick on Paul-Jose M'Poku, free kick awarded. 81:04 Alex Revell fouled by Reda Johnson, the ref awards a free kick. The assist for the goal came from Charlie Daniels. Charlie Daniels crosses the ball from the free kick left-footed from right channel, Paul-Jose M'Poku fouled by Chris Sedgwick, the ref awards a free kick. 81:04 Booking Booking for Chris Sedgwick for unsporting behaviour. Correction - 78:13 Substitution Jonathan Tehoue on for Dean Cox. Correction - 78:13 Substitution Scott McGleish goes off and Paul-Jose M'Poku comes on. 78:13 Substitution Dean Cox leaves the field to be replaced by Jonathan Tehoue. 78:13 Substitution Paul-Jose M'Poku replaces Scott McGleish. 78:13 GOAL - Alex Revell:Leyton Orient 3 - 0 Sheff Wed A goal is scored by Alex Revell from inside the penalty area to the bottom right corner of the goal. Leyton Orient 3-0 Sheff Wed.
76:43 Daniel Jones crosses the ball, Headed effort from inside the area by Clinton Morrison misses to the left of the goal. 74:20 Neil Mellor takes a shot. Save made by Jamie Jones. 73:06 Jermaine Johnson sends in a cross, Andrew Whing manages to make a clearance. 72:24 Daniel Jones produces a cross, clearance made by Matthew Spring. 72:15 The ball is delivered by Gary Teale, clearance made by Stephen Dawson. 71:47 The ball is sent over by Neil Mellor, clearance by Andrew Whing. 70:57 The referee gives a free kick against Scott McGleish for handball. Nicky Weaver takes the free kick. 69:46 Clinton Morrison is ruled offside. Jamie Jones restarts play with the free kick. 69:13 Substitution Scott McGleish joins the action as a substitute, replacing Harry Kane. 68:25 Neil Mellor produces a right-footed shot from deep inside the penalty box which goes wide of the left-hand upright. 67:34 Outswinging corner taken from the right by-line by Gary Teale, clearance made by Ben Chorley. 67:01 The assistant referee signals for offside against Alex Revell. Nicky Weaver restarts play with the free kick. 66:20 The ball is crossed by Dean Cox, Harry Kane takes a shot. Nicky Weaver makes a save. 66:11 Andrew Whing produces a cross, clearance made by Michael Morrison. 63:31 Reda Johnson challenges Alex Revell unfairly and gives away a free kick. Free kick taken by Charlie Daniels. 61:10 Matthew Spring gives away a free kick for an unfair challenge on Chris Sedgwick. Free kick taken by Nicky Weaver. 60:06 Free kick awarded for a foul by James O'Connor on Jimmy Smith. Andrew Whing takes the direct free kick. 59:15 Outswinging corner taken right-footed by Dean Cox from the left by-line, Jimmy Smith concedes a free kick for a foul on Daniel Jones. Nicky Weaver restarts play with the free kick. 59:02 The official flags Harry Kane offside. Nicky Weaver restarts play with the free kick. Correction - 58:34 Substitution Jermaine Johnson comes on in place of Tommy Miller. 58:34 Substitution (Sheff Wed) makes a substitution, with Darren Potter coming on for Tommy Miller. 56:39 Free kick awarded for an unfair challenge on Dean Cox by Chris Sedgwick. Dean Cox delivers the ball from the free kick right-footed from left wing, the assist for the goal came from Dean Cox. 56:39 GOAL - Harry Kane:Leyton Orient 2 - 0 Sheff Wed Harry Kane fires in a goal from inside the six-yard box to the top right corner of the goal. Leyton Orient 2-0 Sheff Wed.
55:42 Harry Kane takes a shot. Save by Nicky Weaver. 52:59 Charlie Daniels takes a inswinging corner to the near post, Michael Morrison manages to make a clearance. 52:04 Reda Johnson challenges Harry Kane unfairly and gives away a free kick. Andrew Whing restarts play with the free kick. 51:56 The ball is sent over by Clinton Morrison, clearance made by Ben Chorley. 51:11 Stephen Dawson gives away a free kick for an unfair challenge on Tommy Miller. Free kick taken by Gary Teale. 50:35 Gary Teale handles the ball and concedes a . 50:35 GOAL - Ben Chorley:Leyton Orient 1 - 0 Sheff Wed Ben Chorley scores a penalty. Leyton Orient 1-0 Sheff Wed.
49:14 Centre by Jimmy Smith, clearance made by Michael Morrison. 47:56 Daniel Jones sends in a cross, Header from close range by Chris Sedgwick misses to the right of the goal. Correction - 46:17 Dean Cox takes a shot. Save by Nicky Weaver. Dean Cox takes a inswinging corner to the near post, clearance made by Michael Morrison. 46:17 Shot from 6 yards from Dean Cox. Save made by Nicky Weaver. Inswinging corner taken by Dean Cox from the right by-line played to the near post, Michael Morrison manages to make a clearance. 45:01 Substitution Gary Madine goes off and Neil Mellor comes on. 45:01 Substitution Mark Beevers is brought on as a substitute for Lewis Buxton. 45:00+0:51 Clinton Morrison concedes a free kick for a foul on Stephen Dawson. Ben Chorley takes the free kick. 44:46 The ball is crossed by Charlie Daniels. 44:23 Centre by Andrew Whing, clearance by Daniel Jones. 43:32 The players leave the pitch at half time. 40:24 Unfair challenge on Gary Madine by Matthew Spring results in a free kick. Free kick crossed by Gary Teale, clearance made by Ben Chorley. 38:10 Free kick awarded for a foul by Stephen Dawson on Lewis Buxton. Gary Teale delivers the ball from the free kick right-footed from left channel, clearance by Terrell Forbes. 37:33 Alex Revell is penalised for a handball. Free kick taken by Nicky Weaver. 32:55 Chris Sedgwick gives away a free kick for an unfair challenge on Dean Cox. Charlie Daniels takes the free kick. 31:58 Gary Teale takes a shot. Save by Jamie Jones. Chris Sedgwick has an effort at goal from close range which goes wide right of the target. 30:40 Corner taken by Gary Teale from the right by-line, Gary Madine takes has a header from just inside the penalty box which clears the crossbar. 29:54 The ball is sent over by Dean Cox, save made by Nicky Weaver. 26:55 Harry Kane is flagged offside by the assistant referee. Indirect free kick taken by Nicky Weaver. 26:16 The ball is delivered by Chris Sedgwick, clearance made by Terrell Forbes. 25:15 Corner taken by Charlie Daniels from the right by-line to the near post, clearance made by Reda Johnson. 25:10 Centre by Jimmy Smith, Michael Morrison manages to make a clearance. 23:23 The referee blows for offside. Free kick taken by Ben Chorley. 22:53 Gary Teale takes a shot. Jamie Jones makes a save. 21:13 Unfair challenge on Gary Madine by Ben Chorley results in a free kick. Lewis Buxton restarts play with the free kick. 19:53 Daniel Jones sends in a cross. 19:06 Reda Johnson concedes a free kick for a foul on Jimmy Smith. Free kick taken by Jamie Jones. 18:30 Gary Teale takes a inswinging corner from the right by-line to the near post. 18:22 Gary Teale delivers the ball, clearance made by Charlie Daniels. 17:22 The ball is swung over by Daniel Jones. 16:52 Unfair challenge on Gary Madine by Matthew Spring results in a free kick. Gary Teale takes the free kick. 15:48 The ball is sent over by Gary Teale. 15:16 The ball is crossed by Daniel Jones, clearance by Terrell Forbes. 13:03 The ball is swung over by Gary Teale, Chris Sedgwick takes a shot. Charlie Daniels manages to make a clearance. 11:49 Inswinging corner taken right-footed by Dean Cox, Michael Morrison manages to make a clearance. 11:30 Unfair challenge on Harry Kane by Lewis Buxton results in a free kick. Free kick taken by Charlie Daniels. 10:50 Shot by Chris Sedgwick from deep inside the penalty area misses to the right of the goal. 10:14 Clinton Morrison crosses the ball, Jamie Jones makes a save. 8:39 Inswinging corner taken right-footed by Dean Cox from the left by-line, Ben Chorley has a volleyed shot. Save made by Nicky Weaver. 8:17 Daniel Jones crosses the ball, Jamie Jones makes a comfortable save. 5:11 Free kick awarded for a foul by James O'Connor on Stephen Dawson. Free kick taken by Ben Chorley. 4:32 Gary Madine has an effort at goal from outside the box which goes wide right of the target. 4:03 Corner taken right-footed by Chris Sedgwick, clearance made by Alex Revell. 3:40 Foul by Harry Kane on Reda Johnson, free kick awarded. Lewis Buxton takes the direct free kick. 2:08 Chris Sedgwick concedes a free kick for a foul on Ben Chorley. Free kick taken by Charlie Daniels. 1:05 Unfair challenge on Matthew Spring by Gary Madine results in a free kick. Terrell Forbes takes the free kick.